Posted on 11, May 2016 by EuropaWire PR Editors | This entry was posted in Automotive, Energy, Gas & Oil, France, Technology, Transportation & Logistics and tagged Common Modular Platform, Dongfeng Motors, PSA Group. Bookmark the permalink. At the presentation of the DPCA strategic plan on Wednesday, 11 May, Carlos Tavares and Zhu Yanfeng, the respective chairmen of DPCA’s two company shareholders, signed an agreement to design an electric version of the Common Modular Platform (CMP), which they have been developing jointly since April 2015. This future electric platform (e-CMP) will deliver a worldwide offering of all-electric, high-performance B and C segment vehicles for the Peugeot, Citroën, DS and Dongfeng brands from 2019. PSA Group and DFM also signed a framework Human Resources agreement designed to increase synergies to develop talent internationally. In practical terms, the agreement will provide for temporary employee exchanges between operational teams in the fields of Research & Development, Marketing, Manufacturing, Finance and Human Resources. Best practices will also be shared in each area of HR to identify potential areas of cooperation. For PSA Group, the agreement goes hand in hand with its Push to Pass strategic plan and serves to address a number of human resources challenges. At the ceremony, Carlos Tavares, Chairman of PSA Group’s Managing Board, emphasised the effectiveness of the collaboration between the PSA and DFM teams and the importance of building on its synergies through talent sharing. 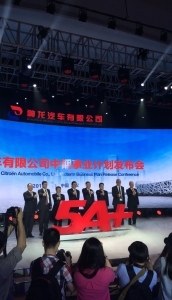 He said: “The future e-CMP platform is a key milestone in our partnership with Dongfeng. It will speed up the worldwide development of both of our groups, while helping us to reach the strict carbon objective set for 2020”. – To significantly increase customer satisfaction with products and services, with the aim of moving into the top 3 ranking in the industry by 2018 and becoming No.1 in 2020. – Generate revenue in excess of RMB 100 billion by 2020. – To ensure profitable, sustainable growth underpinned by productivity gains of 30% by 2020. With its three world-renowned brands, Peugeot, Citroën and DS, the PSA Group sold 3 million vehicles worldwide in 2015. Second largest carmaker in Europe, the PSA Group recorded sales and revenue of €54 billion in 2015. The Group confirms its position of European leader in terms of CO2 emissions, with an average of 104.4 grams of CO2/km in 2015 and is currently the leader in connected vehicles, with a fleet of 1.8 million connected vehicles on the road worldwide. It is also involved in financing activities (Banque PSA Finance) and automotive equipment (Faurecia).